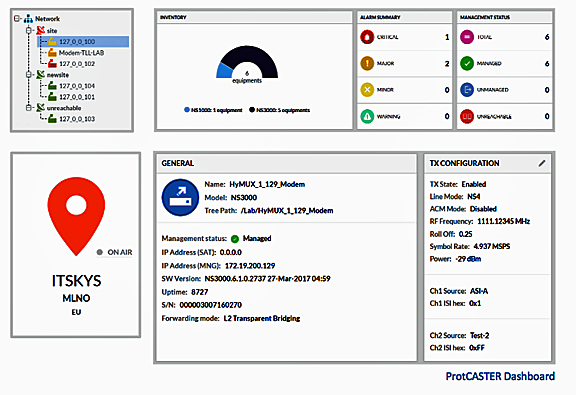 NovelSat has released their ProtCASTER for Data Links, a new data protection solution for satellite-based IP data networks that uses virtually unbreakable AES 256-bit encryption, embedded in NovelSat modems. In the world of global satellite data transmission, where hacking and data theft are commonplace, demand for more secure transmission is high. Based on virtually unbreakable AES 256-bit encryption, ProtCASTER from NovelSat delivers the highest level of data security available for satellite transmission. When working in conjunction with NovelSat NS4, the optional high-efficiency waveform, available only in NovelSat modems, the satellite link protection is intensified even more than when operating using other satellite transmission standards. This level of data encryption is essential for markets were hacking immunity is crucial such as banking, the oil and gas industry, homeland security and others. In contrast with systems where encryption is added using an external device, the new data encryption solution is now embedded in all NovelSat NS3000 and NS3000 satellite modems. It uses a secured OTA channel for exchanging AES keys with remote devices and is integrated with NovelNet, a full-featured NMS (Network Management System) that offers end-to-end network orchestration. NovelSat will be showcasing ProtCASTER at the Satellite 2018 show in Washington, DC, March 12-15, in booth 1833.